The Sea Ray 480 Sedan Bridge is truly a magnificent vessel for something under 50 foot. A 3 cabin, 2 bathroom layout provides you and your guests with comfort, privacy and luxury when staying aboard for extended periods. You will be inclined to sell the house and live on board it is that spacious. The cockpit lounge easily seats 4 adults across, and a folding table and chairs could simply be set up to eat meals from downstairs. Having a solid moulded staircase as opposed to a ladder allows easy ascent into the flybridge, especially when carrying drinks and platters to the sizable entertaining area. Whilst the skipper steers the vessel from the comfortable wing back chairs, several guests can sit forward of the helm station around the table and stay involved in conversation. A bar fridge under the sink is a nice addition to the flybridge as well. An overhead mounted chart plotter and sounder keeps the skipper's eyes up, and leaves more space for the impressive array of equipment on this vessel's dashboard. Sea Ray really know how to fit out their interiors with luxurious materials and wood trim that remain modern to date. 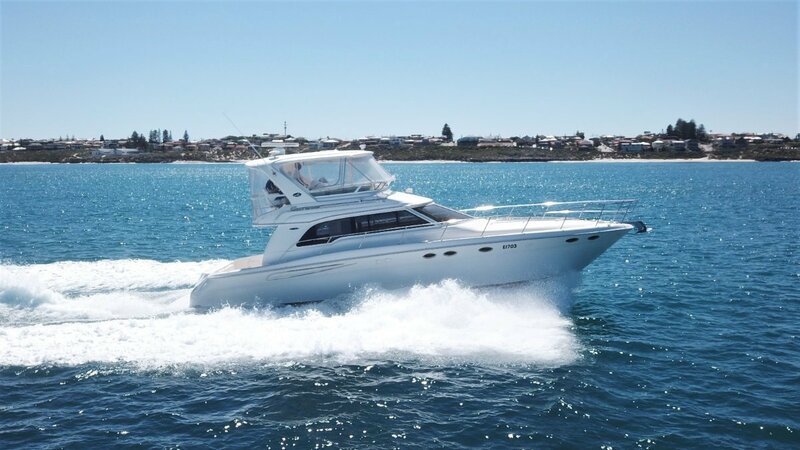 This 480 is fit with 2 lush leather lounges including the 5 seater dinette and the electric folding lounge to port. A galley that would rival a one bedroom apartment's in size gives competent chefs the space to prepare those fresh seafood meals we all enjoy when staying aboard. Another impressive feature is the single level floor from the cockpit all the way through to the cabin's forward staircase giving the saloon an expansive feel. The forward master cabin boasts a walk around queen bed and surprisingly large ensuite, free of clutter or awkward bulkheads. To port you have a large guest cabin with secondary access to the day head. The starboard guest cabin has 2 singles bunks perpendicular to one another and access to the washer/dryer, a luxury you wont be able to do without for those longer stays at Rottnest or the Abrolhos! The twin Cummins QSM 11 660HP diesels are economical, smooth and reliable. They effortlessly push the 48 footer up to 30 knots, or a comfortable cruise speed of 20 knots at 1750RPM burning 120L p/hr. For more information or to inspect this immaculate vessel contact Tom or Matt Lovelady on (08) 9243 6373 or email sales@oceaneermarine. Com. Au. accomodationTwo large queen suites: forward master with en-suite, port VIP cabin with day head access, crew cabin to starboard with 2 singles + washing machine/dryer, electric fold out lounge in saloon. Air ConditioningDucted throughout saloon, cabins and flybridge.